Looks like my entire Simplex topic got lost in the recent migration because I probably started it after the 10th. So to recap.....I have bought a part built Simplex. Frame is completely built. Cylinders are complete though not fitted. Motion work and valve gear was almost complete and fitted. I have now made the last of the Walcherts rods and am trying to do a basic setup to check everything is ok.
How much of the ports should be visible at each end of the valve travel? My guess is that the whole of the relevant port should be uncovered otherwise what is the point of it being that width? I have removed one valve and replaced it with clear plastic so I can see the ports as I move the wheels. I have some markings showing a centre gap the width of the exhaust port, one inlet port and one dividing land giving a gap of about 18mm. This represents the hollow in the base of the slider to exhaust each port in turn. I have then marked each side at 4mm to give land to seal down to the cylinder valve face but leave a port fully open at each extent of valve travel. Is this correct or am i missing something? How much of the ports should be visible at each end of the valve travel? My guess is that the whole of the relevant port should be uncovered otherwise what is the point of it being that width? How much is uncovered depends on how far it is "notched back". You should look to set the valve so that the travel/amount uncovered is equal at either end. I understand it needs to be equal but how much should be uncovered? It needs some lead but 1mm sounds about right not nearly 4mm which leaves the port's virtually blocked. will be sprayed. Going to fit brakes as everything is refitted then it's boiler time!! Video posted below. It's a bit jumpy to start with but improves....Photo bucket issue. Ignore the compressor in the background and you can hear the simplex. You never got a proper answer on your valve travel question. With Walschaerts valve gear the valve travel is determined by the design. It is not something you can set. All you can set is the valve position on its spindle. For an initial setting, put it in mid-gear and set for equal opening at each end. You may later find you want to make minor adjustments, but wait until it is in steam and doing work. You can then find the best compromise for a range of cut-off settings and balancing good forward gear with acceptable reverse gear running. Thanks Chuck. I put the original slides on and set to midway so worked reasonably. I have completely stripped the frames for painting. All the valve running gear and con rods have been removed. All have been sanded, worked and fettled ready for surface treatment. As detailed on another of my posts on this forum I have gone through several processes but still come back to good old paint. All the bearing ends have been case hardened to protect them and give hopefully a decent life to them. Here I not a couple of problems. My nickel plating and later zinc plating systems could not cover the surfaces well enough on top of the case hardening. The higher carbon content showed through. Not wanting to waste too much time I hung all the parts on some long rods and with them suspended between two wheelies bins I primed and spray enameled them. They are all now sitting waiting to be refitted. The wheels were dropped as complete axles and as there was not a lot wrong with them they were just cleaned of some of the paint on the rims and treads and then the centres of the wheels resprayed. I am now in the process of building and fitting brakes to the centre and rear wheels. I have borrowed the super simplex articles from my local club and scanned them to use as guidance. I will take some pics as they progress. The cylinders are off at the moment and will have all seals and gaskets fitted on their edit to the frames. I have got some round and some square graphite string for the seals. I am not sure about the pistons on this. Do i need to fit cast rings on them​ or can I use the square graphite string? The cylinders are cast iron. Is there any other material that would make good rings apart from CI? Thanks Stuart. For the sake of thirty quid I will probably go with CI rings but first I need to check my spare plastics box cos i seem to remember buying a lump of PTFE as a might come in useful item. If i make PTFE rings will there be any expansion problems. I know i have a few lumps of stainless. Will we also decent rings? Oil port already on the to do list. I started building some brakes today for the simplex. I drilled the frames for the support bolts and put a locknut on the inside. I then decided i ought to check the clearance needed for the boiler. This turned out to be only 3mm......Not very much!! As it's only a parking brake I have decided to only put brakes on the rear of the back wheels. While I was checking the frames and the clearance for the boiler i remembered something the boiler inspector said last weekend at the club...."machine some off the top of the rear horns". 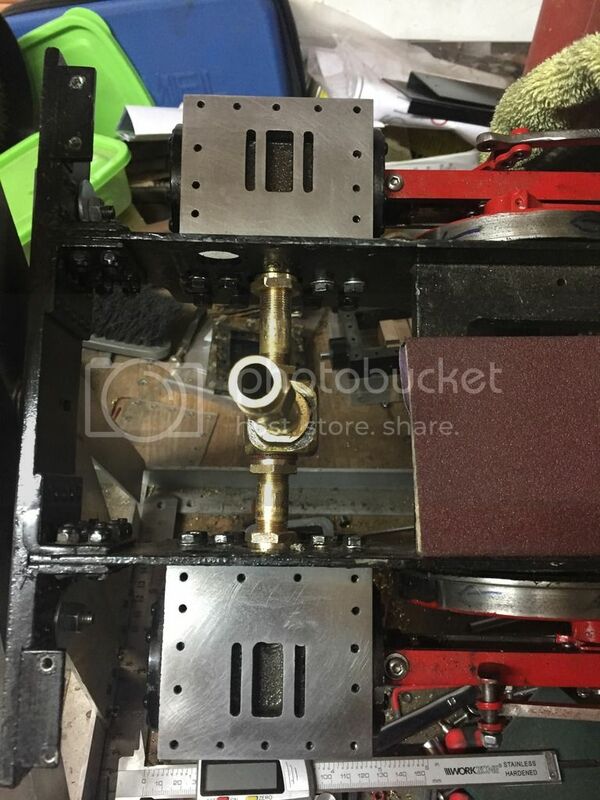 I made a card cutout of the side of the firebox and held it inside the frames. Thank you Martin Evans......The boiler will not fit the frames. I removed the axles and wheels and took the frames to my mate Richards workshop and borrowed his S3 mill. This mill is bigger than mine so can hold the frames better. Machined the top to allow clearance for the boiler to sit in properly. Glad I sorted this before reassembling all the running gear otherwise it would have needed a complete strip down to machine the hornplates once I had found the boiler did not fit. Been a while since I posted on this. With a few issues about copper grades resolved and copper bought I have started building the boiler. When I bought this part built loco it came with a piece of tube partly cut to form the boiler and all the plate cut, formed and marked for the holes and bushes. The tube was too short and had also been badly cut so it has been put to one side for a future project. I bought a new length of 4 3/4" 3mm thick copper. I cut it and fitted the front plate assuming it was correct. Next job I checked the front firebox tube plate and found it wrongly sized. Checking the rear plate this was also wrong. I decided to cut some former plates from some 12mm steel I had acquired and reform the existing plates. I soldered the tubes into the front plate surprisingly easily and was well pleased with the job. Next job was to form the wrapper for the firebox. This is when I realised the the plates were still the wrong size. I had made them better but had not corrected the size. I removed all the tubes from the plate and made new plates. Once the tubes were soldered into the new plate I formed the wrapper. I made a rough wooden former for this. This wrapper has been soldered to the firebox rear plate. It will be cleaned in the pickle later. I now need to solder the front plate into the wrapper but not done yet. In a sudden fit of common sense I decided to try the main tube and firebox in the frames and it does not fit!! The front plate I have fitted is about 4mm too big and has made it too wide to fit the frames. Looking back I should have checked the existing plates better and done what I have now done....make my own. This afternoon I made a new former for the front plate and backhead and made new plates. I then spent a very hot and sweaty hour or so removing the faulty plate. All is in the pickle now for a new attack on it later this week. Here's a better pic of the new firebox plates ad wrapper. Sorry last post had small pics. I have only just started with use.com so getting used to it. Not worked out how to get pics bigger so this one small aswell. Having ripped the front plate out of the boiler I felt I ought to solder the new one in. Looks alot better and fits the frames now. Those of you with a perseptive eye will see it does not quite sit level in the frames. It is sitting on the rear hornblocks even though I machined oer 10mm off the top of them. Need to check I have not left the botton of the firebox too low. To check this I have assembled the ashpan to use as a template. This was bought as a kit from Model engineers laser services. They are a bit fiddly to assemble but once together it is silver soldered. Today I also soldered all the firebox plates together. Everything is now in the pickle ready for checking tomorrow. If necessary I will reshape the inner and outer firebox bottom shapes to fit in the frames and the ashpan. Once done I hope to make a start fitting the boiler together!! Sorry I have been a bit remiss with my updates. Got held up on some construction for my daughter but dine now. Yesterday I set about arranging everything to join the two halves of the boiler together. Everything clean and ready. Put the inner assembly into the outer boiler tube and firebox. Used some 8mm bolts to help align the tubes to the front tubeplate. Everything has been assembled with flux on everything. The front foundation ring is on and has two rivets through it to hold it in place while soldering takes place. This morning was solder time. The boiler was stood up on its end with the hearth built around it. Next it was laid down on its top so the front foundation ring was accessible for soldering. It took some heating but eventually got it done. Happy with both solder jobs today. It certainly took some gas and some heat. I sweated like a pig and I think the amount of gas I used would cook Sunday dinner for all my family and friends. All in the pickle now for a good clean before these joints are checked and I move on to the stays. Your boiler is looking great, Julian! A lot of work goes into one of these! I'm getting close to starting on my first boiler, so taking careful notes of how you are doing things here. Thanks for the great pictures and explanations. How many shop elves DOES it take to hold the other torch? No shop elves just me. I have a turbo torch with the swiveling pipe that is free standing. One of the others like a plain propane torch wedged under one of the hearth blocks. The third is in my hand for free controlled movement wherever it is needed. Leaves a hand free to hold the solder stick. Thanks for compliments guys. I certainly think the first big boiler is a very steep learning curve when you finally get to do it yourself. Now I am into this one I would have less worry about doing another. Already got my next two planned. You also learn little changes you need to do to make it easier for yourself like buying some better heatproof gloves to easier move positions. That is some very serious solder work, beautifully done. Here is a view many will not have seen. I bought an endoscope for a tenner online from china that sends real time views via wi-fi to my phone. I poked it inside my boiler to see the inside of the smokebox tube plate today. Pressed the button and got several photos. Here's a couple for you. Ahead you can see the tube plate, bottom left are a couple of the tubes, on the right the main boiler tube and on that one of the water feed bushes. Happy with the results from inside!! I heard from our boiler inspector today and he has approved the use of copper rivets for the stays. This saves me making 51 individually from phosphor bronze rod. Rich has ordered some for his Conway and some for me. Today I finished off the two side pieces of foundation ring which are fixed temporarily in place awaiting the arrival of the stays. Until they arrive no more progress will be made on the boiler so tooling up and learning thread cutting in the lathe. Not posted for a while due to elderly parents needing repair and maintenance! I have been working away to finish the boiler but took very few pics. I get so involved i forget to take them. As this was my first large boiler it has been a very steep learning curve with many minor leaks that constantly appeared as i was trying to seal it up. I inserted and removed the plugs so many times thatt i wore out the threads on the boiler bushes. Once i could not get a seal on them i decided to make the drastic move to remove and replace all the bushes. I machines new ones but this time made them blind. I left 3mm of metal intact so there was no need for plugs. They have all had some machining including starting the threads but they will need the final drilling once tested. This approach completely changed the boiler testing and sealing and it moved on very quickly after that. I will post pics at some point for you. I have decided that all future boilers i build will have blind bushes from the start. The only ones not blind are the safety valve bushes to allow filling, emptying and testing. Already got another in progress and three others in the pipeline. I have posted nothing on this topic since May last year. I tend to take very few photos and just get on with building. I am close to completing this loco. Tanks, smokebox and boiler cladding have all been made and sprayed and are ready for fitting. I will try to take some pics today and post them.Before they all get fitted I have been setting the valves to work the best they can on air ready for moving onto steam. I thought this video might be of interest to you. Yesterday I got fed up of repeatedly removing the valve chest covers to check settings so I made some out of clear acrylic sheet so I can see the valve movements and the effects of any adjustments. A few pics for you. It is reasonably smooth but a bit uneven. The eccentric rods are the wrong length so the valves on the left cylinder is opening differently from the right. I have made some adjustable eccentric rods to finalise their lengths and adjustments. The rods are 100mm centres but need to be about 97mm on the right and 99mm on the left. The adjustables will stay on until the boiler is steamed and run to allow any further adjustment then permenant rods will be made to the final sizes. Looking and running good Julian! Well done! It is reasonably smooth but a bit uneven. I appreciate your encouragement but also like constructive and helpful criticism. I have decided to take the opportunity to remove the valve chests and to clean up the port faces and the slide valve face while it is partially stripped. The cylinder to chest gasket was leaking slightly so that will be replaced. The studs are rubbish. They are the originals made by the previous owner/builder which I altered to be a better fit. BA thread into the cylinder with M3 thread at the top. Going to re-drill and re-tap completely to M4 for a better thread. I use metric all the time. I do not possess any Ba taps. I will make 4mm studs as I don't want to use m4 studding through the chests. My plan is to use stainless rod. I have an issue with use.com as I cannot upload any photos from my iPhone at the moment. When I can again I will post a pic of the cleaned port faces. Rich has seen this loco through all its faults, changes, rebuilds and progress with some valuable input and whiskey! Every little bit helps!!!!! Thanks for your comments and input. use.com don't seem helpful so I uploaded to photobucket. Bad Behavior has blocked 16058 access attempts in the last 7 days.